Dark walls create a dramatic backdrop for white furniture and metallic accents. Create a high-style, sophisticated dining room with navy or charcoal walls and add an ivory dining set for contrast. In the living room, a white sofa set with metallic accents create a cool contrast to dark walls. Speaking of dark colors, navy blue is the “it” color of 2016. If painting your walls dark blue is too daring, you can incorporate navy or dark blue pieces for a contemporary look. A navy blue swivel chair or a beautiful, shaggy cobalt blue area rug will add that pop of contemporary decor. Though contemporary design typically eschews overdoing it with texture, incorporating a few textured pieces can warm up a contemporary space. Add a contemporary shag rug or a textured ottoman to soften the edges of a contemporary room. Metallics are a hallmark of contemporary decor, and they are hotter than ever. Whether it’s platinum, gold, nickel or bronze, anything that shines will add style and sophistication to any room. Add a platinum sideboard in the dining room, a gold-legged bench in the living room, or a bronze vanity stool in the bedroom for pops of shine. Funky pedestal tables are one of the top contemporary decor trends this year. They add height and interest to a room without taking up much space or putting too large a dent in your wallet. An pedestal table can display art or serve as a plant stand. Contemporary design is sleek and stylish, but this year, the focus is on bringing glamour to rooms that are typically casual and comfortable. Family rooms, in particular, are getting a much-needed makeover with high-style living room furniture. Adding a metallic coffee table and a modern, white-finished TV stand rounds out the contemporary feel. 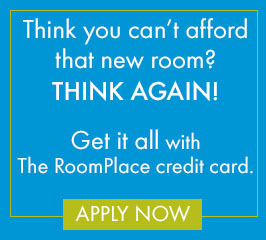 Staying on trend with contemporary style is easy and affordable at The RoomPlace. Whether you want to ease into contemporary design with a few accent pieces or go all-in with a 3-piece living room set, you can Get It All at The RoomPlace. 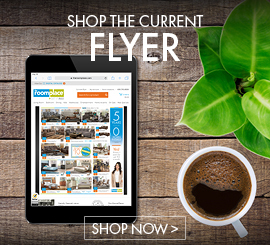 Check out our wide selection of contemporary furniture online at www.theroomplace.com and follow us on Instagram and Facebook for more design inspiration and frequent promotions.